Before the Empire Theatre was built, the Lake George Stage Coach Company used the property for its local barns. 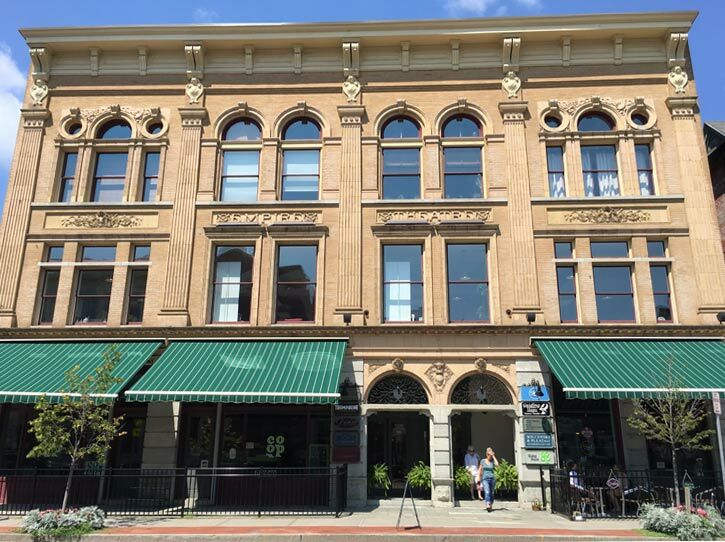 In 1898, several prominent Glens Falls businessmen, including banker A.B. Colvin, Charles W. Cool, builder and brick manufacturer Daniel DeLong, and architect Ephraim B. Potter, took over ownership of the property and replaced the barns with a playhouse named the Empire Theatre. Built from 1898-1899, the Empire Theatre was designed by New York City architect J.B. McEphattrick as a three story neo-classical building, similar to others of the American Renaissance period. Frederick Kettler, also from New York City, designed the interior decorations. The brick theatre was constructed out of Warren County granite with a terra cotta front. There were two concert halls, a lecture hall, dancing halls, and an opera house with enough seating for up to 1,200 people. The third floor ballroom, which was regarded as one of the finest in the region, had a painted ceiling and a metal ventilation dome. Other rooms included an auditorium, kitchen, card rooms, parlors, toilette rooms, and the Empire Billiard Room in the basement. Addison Colvin was selected as the first president and general manager of the Empire Estate and Theatre Company, the name of the business venture. He held those positions until 1913. James A. Holden was one of the original stockholders, and at times he acted as manager, secretary, and treasurer. On October 6, 1899, the Empire Theatre opened to a packed house with a production of "Way Down Easy," and from there, the theatre became very successful throughout the late 1800s and the early 1900s. The Empire Theatre hosted some of the largest and most popular theatrical productions in the country, such as "Sowing the Wind," "The Musketeers," "Jack and the Beanstalk," and "Shenandoah." Additionally, many well-known names performed at the theatre, including Billie Burke, Al Jolson, and John, Ethel, and Lionel Barrymore. The theatre flourished over the years, and the local population had easy access via electric trolley cars. However, at the turn of the 20th century, the rise of film and radio meant a decrease in the popularity of live entertainment. The theatre began to show 10 cent Saturday morning movie serials to compete with movie houses. Unfortunately, by the 1940s, the theatre was losing money, and the building went up for auction in 1946. The Empire Theatre passed to Judge McPhillips, and in 1950, the building was emptied and renovated by the Duplex Construction Company. After the renovations, the building was rented out to other businesses. The New York State Employment Office occupied the second floor for a period of time, Continental Insurance rented space, and stores opened up on the ground floor. The building had lost its prominence as a premier attraction in the area. In 2008, the Kaidas family brought the building back to life with new renovations. The family business focuses on real estate development and renovations in Upstate New York. While the historical decorations and architecture were maintained and preserved, the Kaidas family turned the former theatre into a mixed-use building named the Empire Theatre Plaza. Today, the first and second floors house rentable retail and office space, and luxury apartments are located on the third floor. There are eleven apartments, and each features high ceilings, hardwood floors, and original theatre elements. The Empire Theatre Plaza brings together a historical setting with modern pieces, such as an elevator, a fire and sprinkler system, and an integrated security system. Although one of the region's most significant and historic theatres is no longer in operation, its name and history continue to live on at the Empire Theatre Plaza.